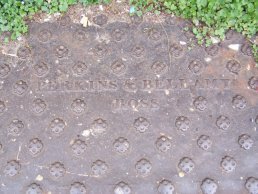 Perkins and Bellamy were active in the town during the later part of the nineteenth century and opened their foundry in around 1850 and it closed in 1900. 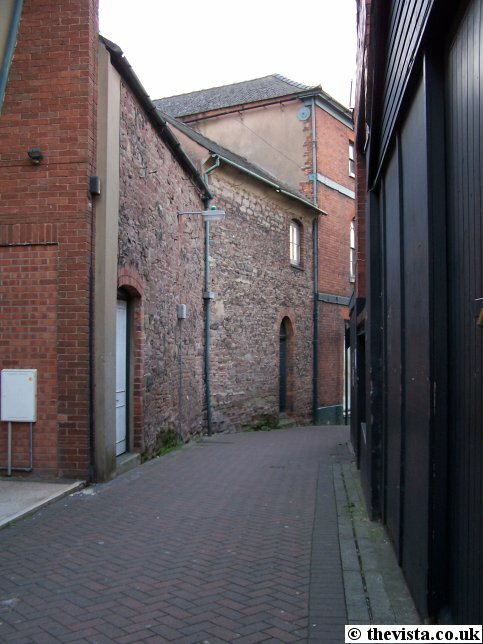 It was located in Broad Street and they employed around 70 men and boys to produce their wares. 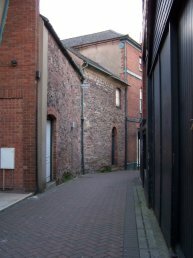 Their Broad Street foundry was quite an extensive collection of buildings. 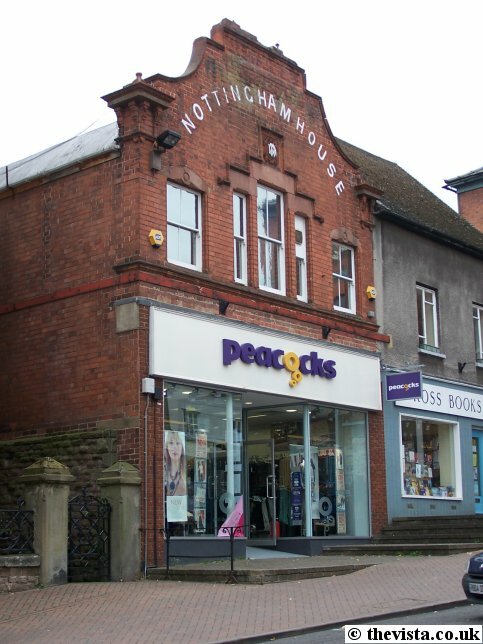 The front of the foundry was up where Peacocks are now (in Nottingham House) and Country Casuals on the opposite corner. 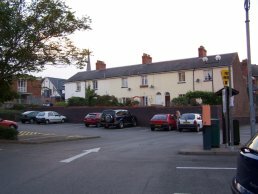 The foundry then extended back into the Crofts and this resulted in the Crofts getting the nick name of "Bellamy's Lane". 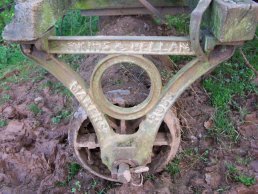 Perkins and Bellamy produced a wide range of products from agricultural equipment, including complete Barn kits, to drain covers and water channels to household goods. They classified themselves under a number of headings and these included Agricultural Implement Manufacturers, Agricultural Implement Dealers, Agricultural Engineers, Iron and Brass Founders, Iron Merchants and Ironmongers and along with this they also had expertise as Gas fitters, Locksmiths and Bell hangers, Oil and Colour Men and Tin-plate Workers showing that they had a broad range of interests and skills. 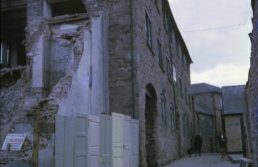 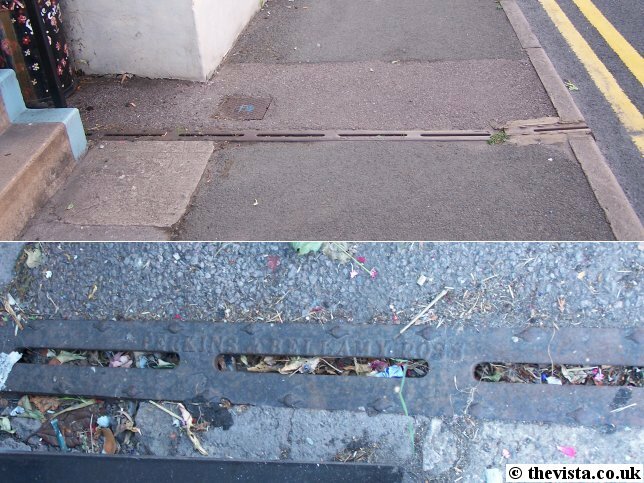 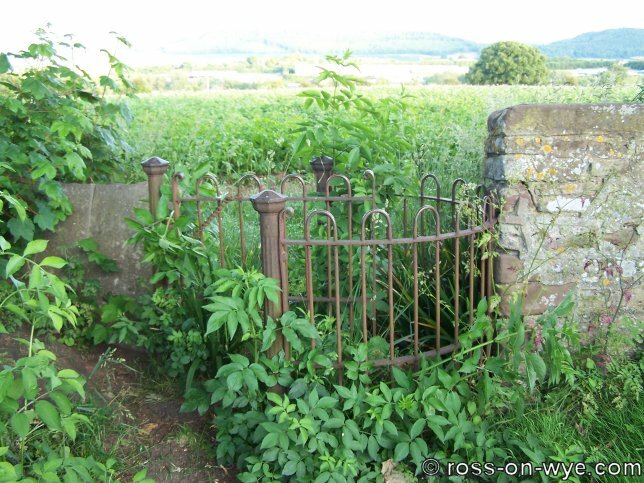 Evidence of their work can still be seen around the town in the form of cellar covers, rain water gullies and kissing gates. The plant had its own private electric light plant which was before the rest of the town had this luxury. 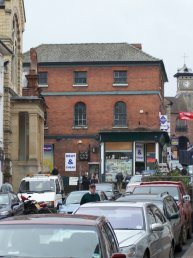 Once the Perkins and Bellamy foundry closed, the building was empty for a while but during the First World War the building was used as a jam factory. 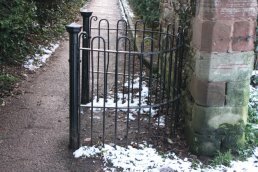 A Perkins and Bellamy kissing gate at the entrance to the Church Yard at the end of Old Maids Walk. 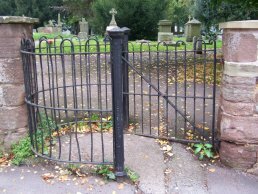 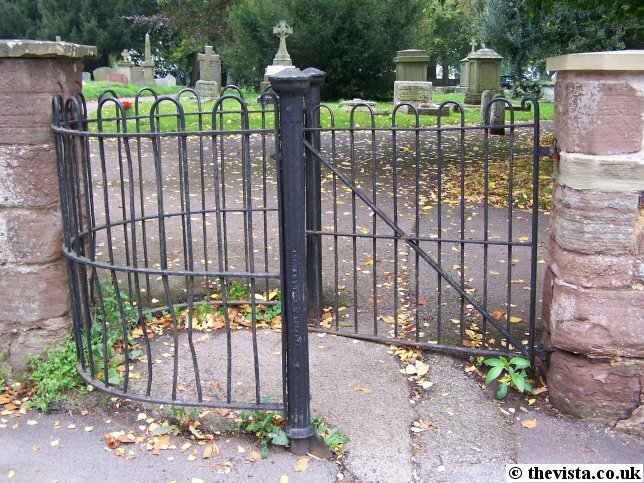 In the south-east corner of the Church Yard is the remains of another Perkins and Bellamy kissing gate. 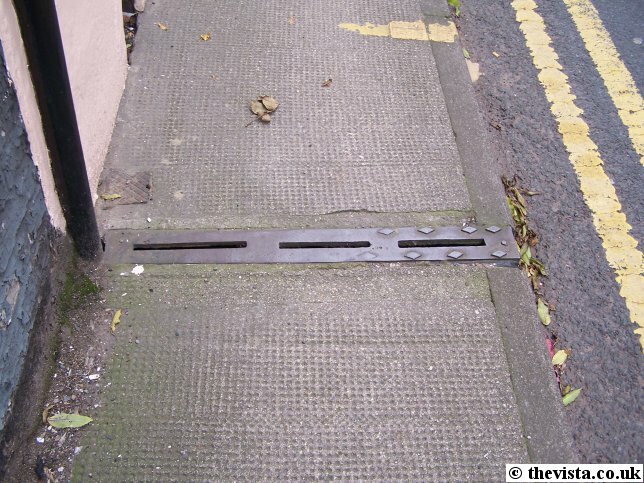 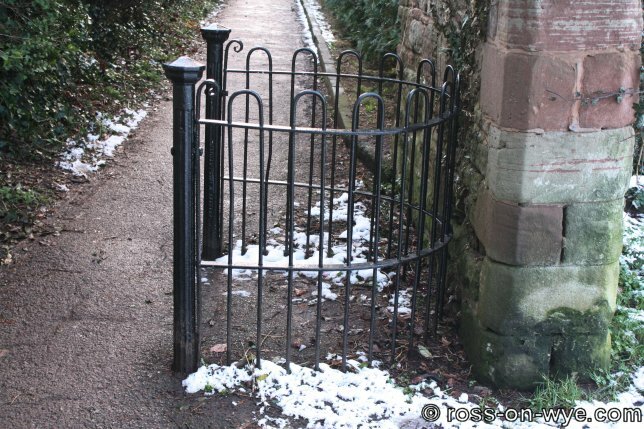 The gate itself and its post are missing or have been removed to open up the pathway but the makers name is still clearly visible on the part that remains. 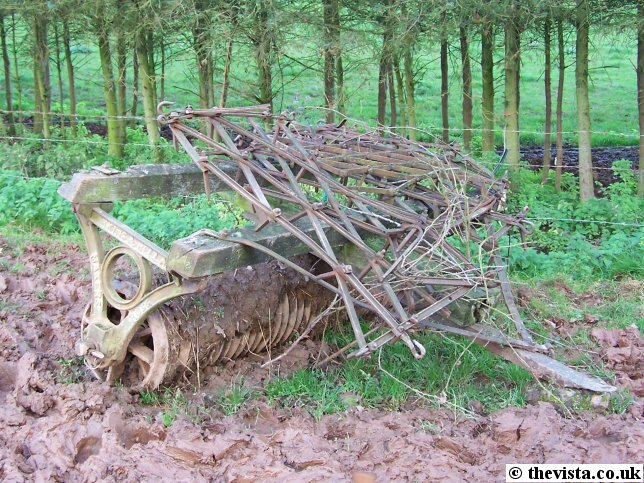 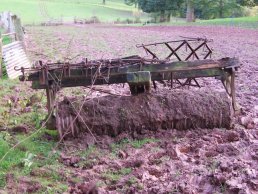 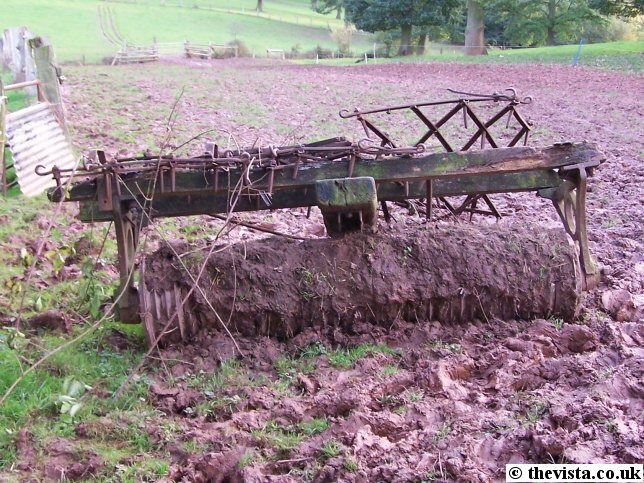 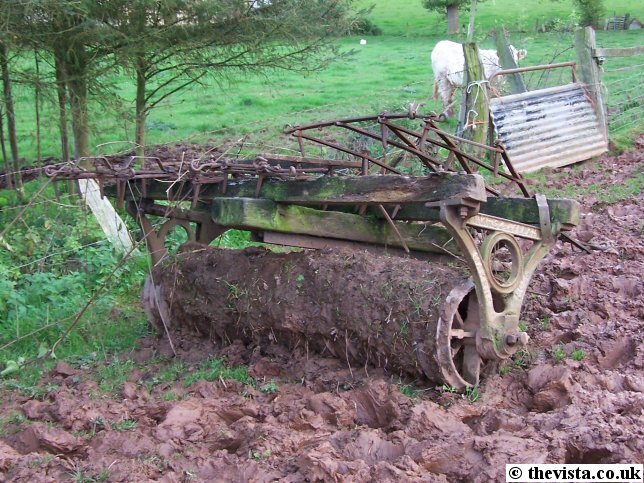 This is a example of a Perkins and Bellamy roll that was buried under a bramble patch in a local farmer's field. 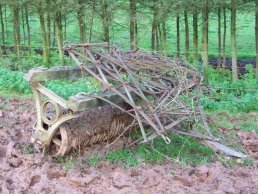 I would like to thank Mr. Bryan Davies for his help by pulling it out and allowing photographs to be taken of it and my dad for remembering where it was hidden. 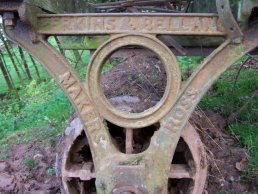 Mr. Davies said that he has done various repairs and replacement of the wooden frame over the years, and this is illustrated by the use of part of a railway sleeper as the central part of the frame. 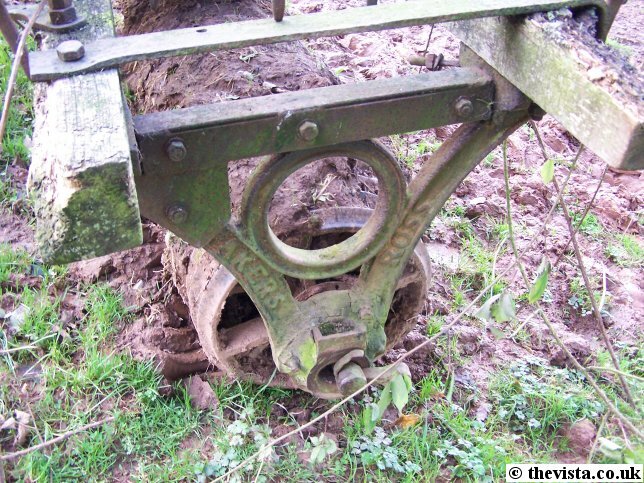 The metalwork on top of the frame is part of a harrow and was not part of the frame. 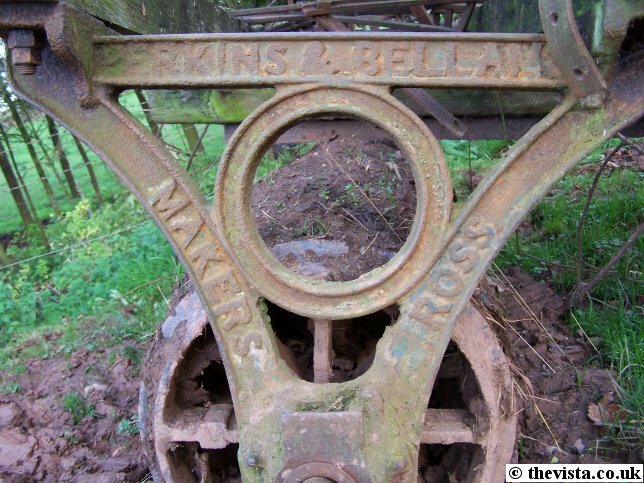 Here you can see the uprights that connect the frame and the roll itself together and has 'makers Perkins and Bellamy Ross' as part of the casting. 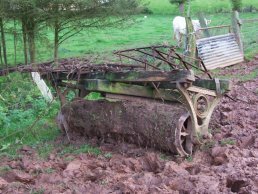 The other side of the roll has been repaired, Mr. Davies said he had not done that repair and it had been like that for at least the last forty years. 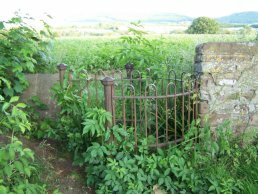 Whilst out and about I noticed this kissing gate and, after a bit of further examination, it turned out to be a great example of Perkins and Bellamy's work. 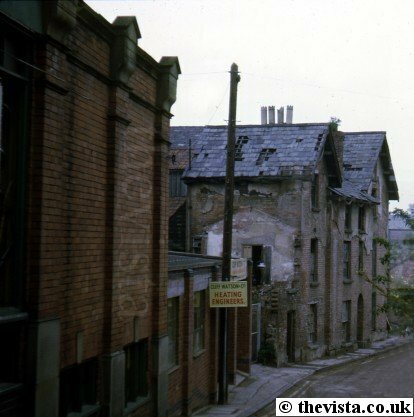 It is very likely that the men working in the foundry lived in the Crofts and along Crofts Lane. 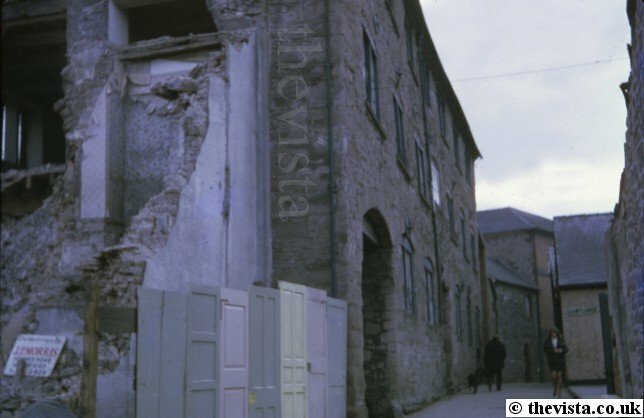 The Crofts where renovated around the 1970's as the buildings had fallen into a very poor state of repair and only one house was still occupied at that time. 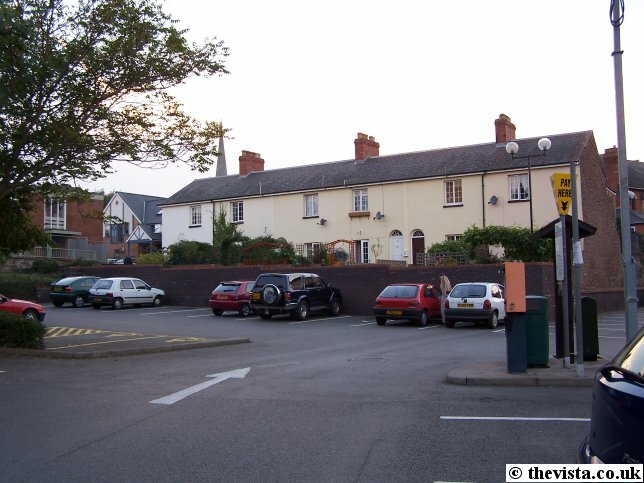 The roofs were replaced among other modernisations, making the properties into desirable houses. 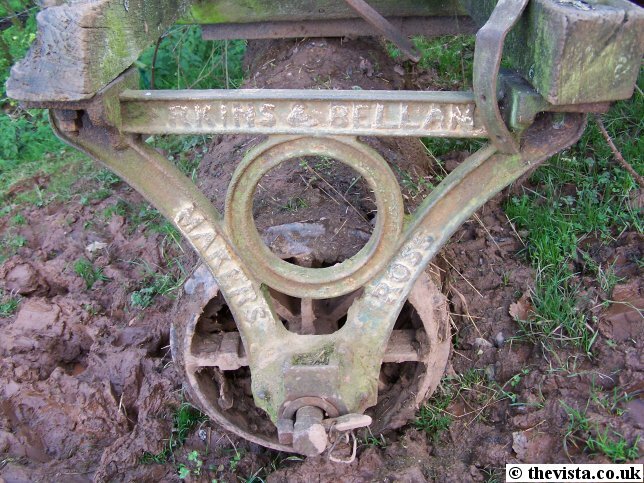 The Crofts, these probably housed Perkins and Bellamy employees. These are some old views around the site of Perkins and Bellamy before the Crofts was redeveloped. 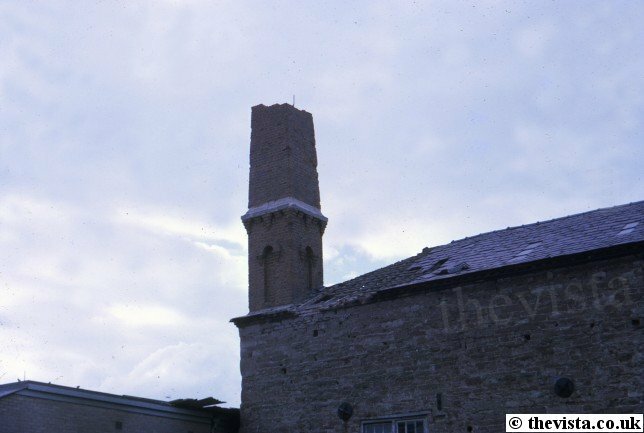 The chimney was one from the foundry and it was also used by the jam factory that used the site during the war. 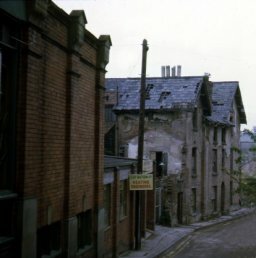 In the view of Crofts Lane, the buildings in the foreground and to the left was the side of the foundry buildings. To the right are the public toilets that used to be in the Crofts. 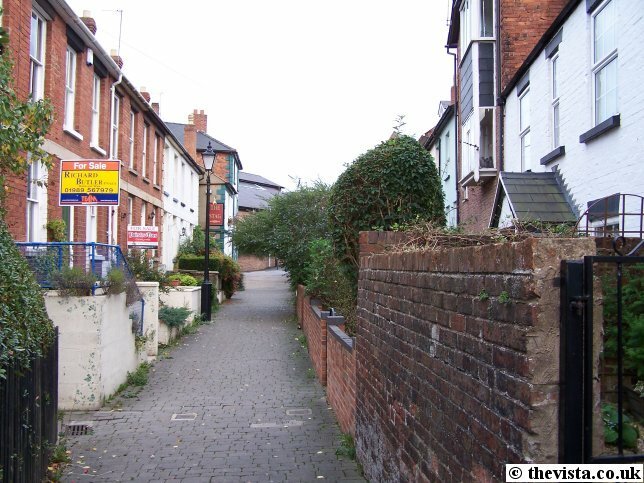 The view below left is down Hill Street past the shop that was Cliff Watson Heating Engineers, that this is now Acorn Video, to the large and very dilapidated house that was at the bottom of the hill and at the back end of the foundry. 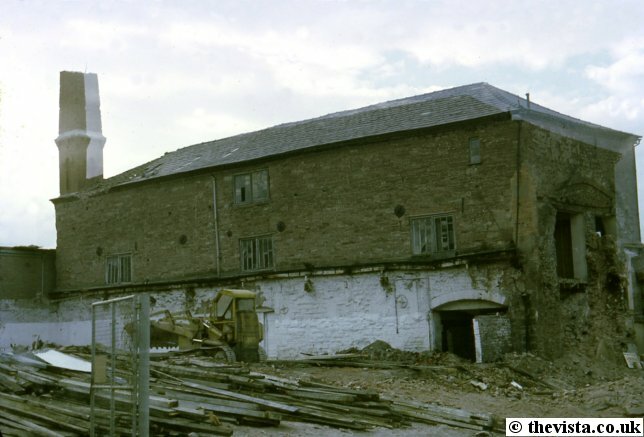 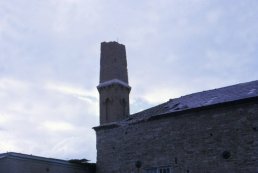 Once the old house was pulled down, the main foundry building could be clearly seen as in the above right photo, it was unfortunately a double exposure but luckily only the roof and chimney are affected. 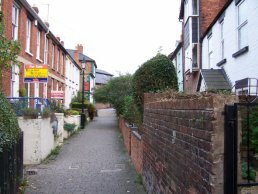 The gates, just visible in the middle bottom of the Hill Street shot, are still standing to the left of the phot marking the position of the house relative to the foundry. 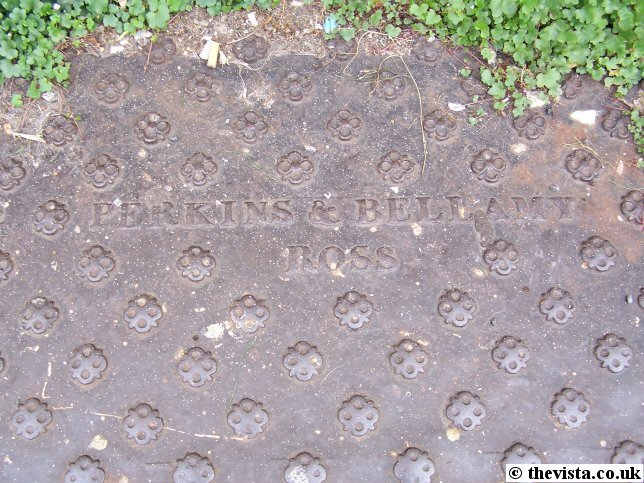 There are quite a few examples of Perkins and Bellamy's work around the town, details of them follow. 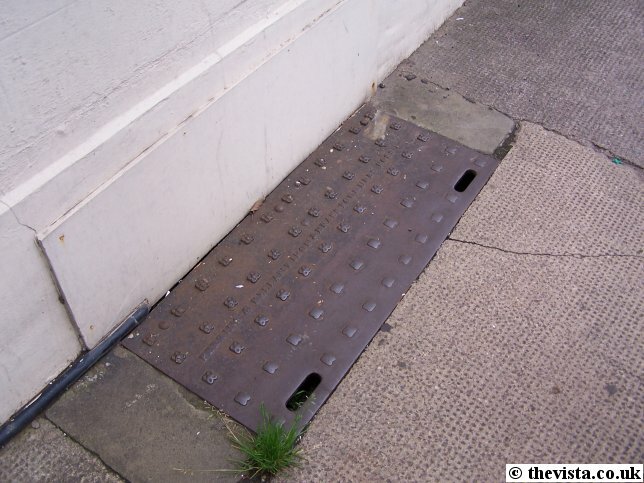 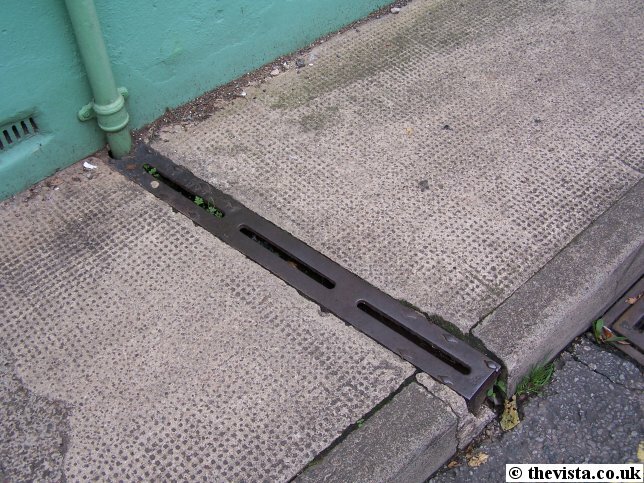 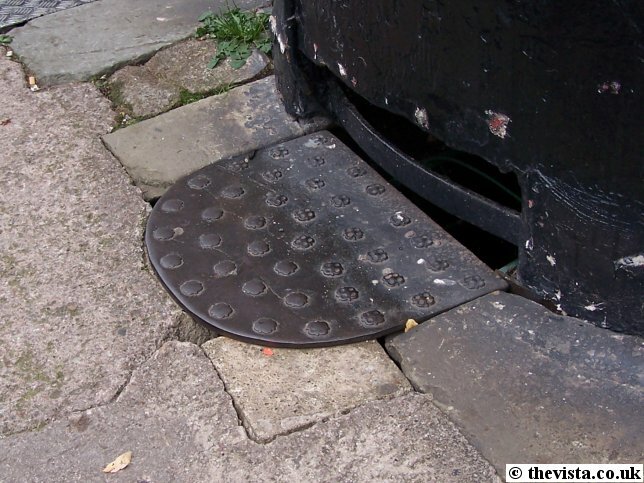 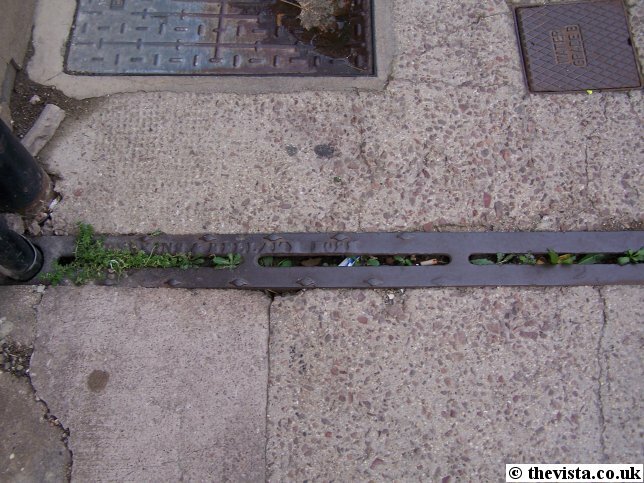 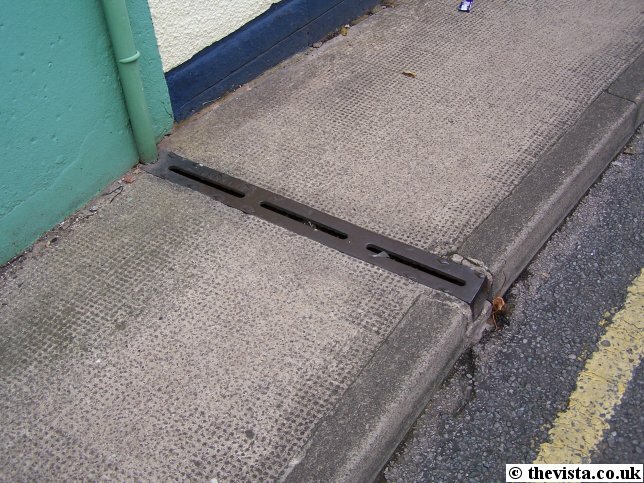 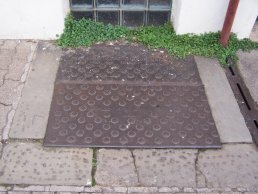 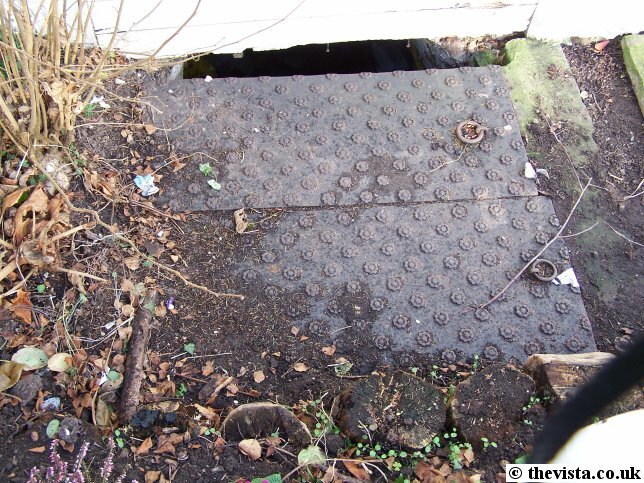 An example of a Perkins and Bellamy cellar cover and gully. 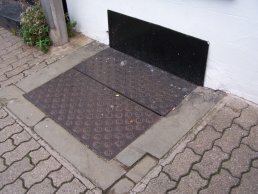 On the north side of the Church Yard is this partially covered cellar cover that is in really excellent condition. 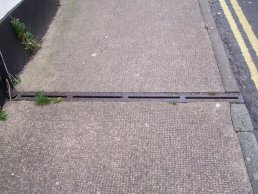 Although it is unmarked, it's distinctive style marks it out as a unmistakable example of Perkins and Bellamy's work. 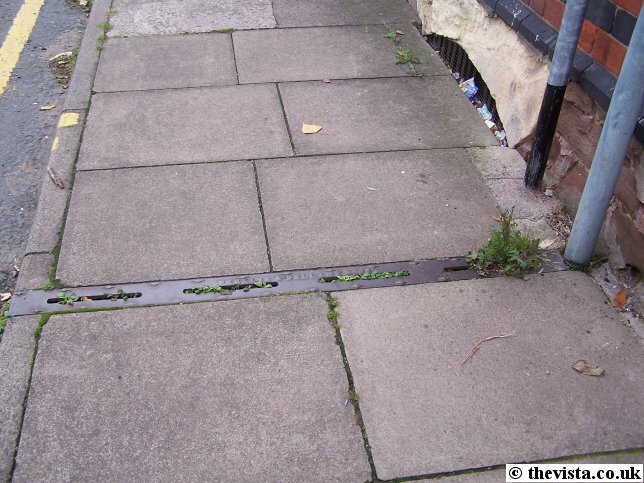 At the bottom of Brampton Street is this example of Perkins and Bellamy's work. 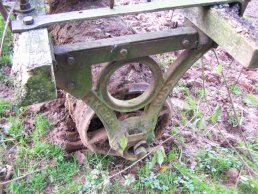 It is not in a particularly good condition. 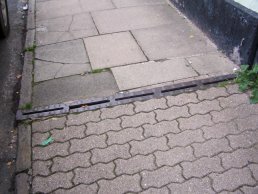 Near to Merton House is this example of Perkins and Bellamy's work. 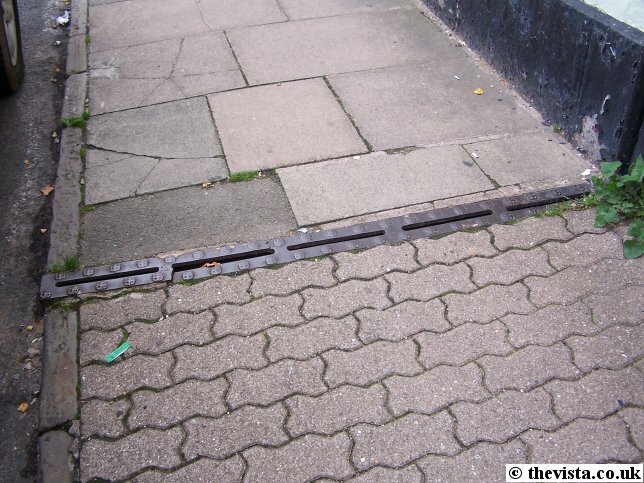 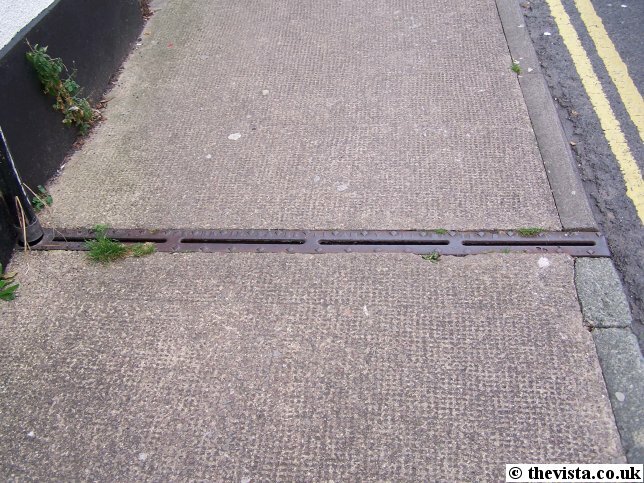 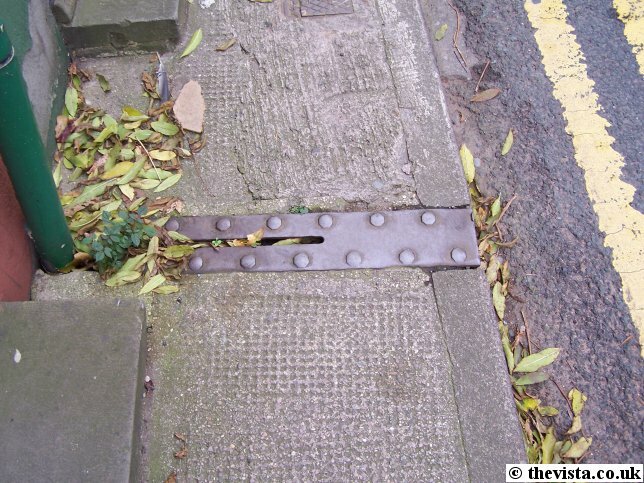 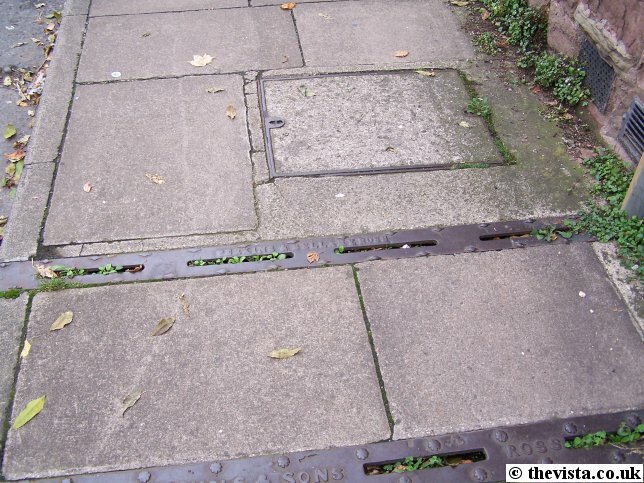 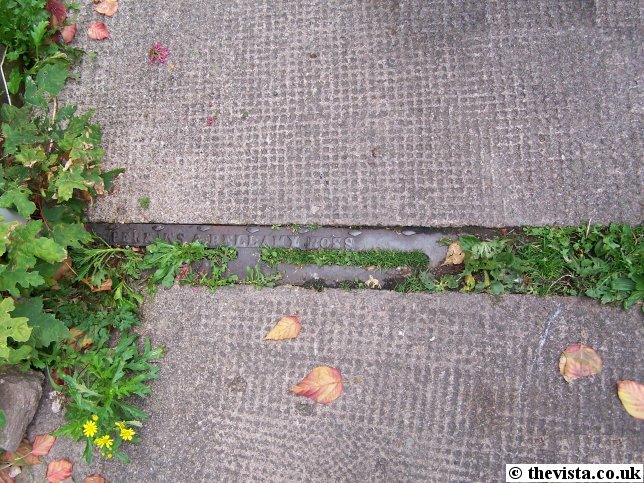 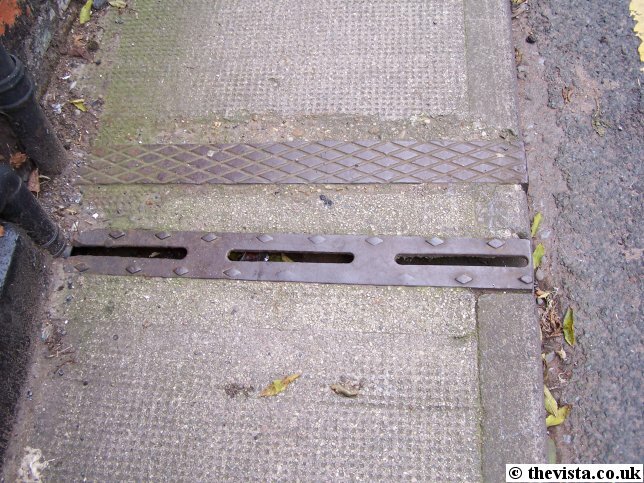 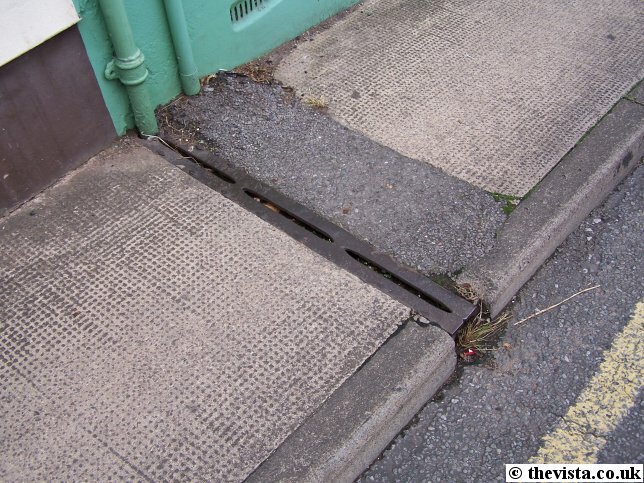 It is in good condition although it has been repaired or extended when changes have been made to the road or pavement.